If you haven't become familiar with Coupon Academy yet, you may want to start there first. However, if you are already comfortable with the basics of couponing, this page will help you stretch your dollar even farther at Target. I believe that Target may have a coupon app that you can install on your smart phone, in order to somehow use it at the checkout. I really have no idea how that works, but for the more technology savvy shopper, it would be worth finding out more. For the rest of us, I will explain the basics of paper couponing at Target. Target offers printable coupons here on their website. 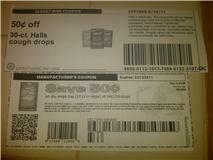 You can select and print a wide variety of coupons, depending on your needs and interests. Keep in mind when it comes to the groceries, that unless you have a Super Target, the store will not carry many of the coupon items. It's always a good idea to browse the shelves a time or two before wasting your paper and ink on items you won't be able to purchase. What's awesome about Target is the savings you can achieve when you stack Target Web coupons with manufacturer's coupons for the same item. When you visit Target's coupon page, keep in mind that not all of the coupons will be Target Web Coupons. They actually have a fair number that are manufacturer's. More than once I've printed a coupon, knowing that I have one from my Sunday paper insert to stack with it, only to find that it wasn't specifically a Target Web coupon. You cannot stack two manufacturer's coupons. Here is an example of how stacking at Target works. From time to time, you will get a Catalina coupon back from Target at checkout from a participating sponsor. For instance, I purchased some light bulbs on one occasion, and then received a coupon back with my receipt for $1 off of another package. Those will print out with the Target logo, and you generally will only be able to redeem it at a Target (though some stores will accept coupons from competitors). However, they do say "Manufacturer's Coupon" at the top. I have been able to successfully stack those with other manufacturer's coupons successfully at my local Target, though other regions or certain stores may not. Target does not accept competitor's coupons, such as coupons offered as "Store Coupons" or those from store-specific monthly booklet. The cash register or cashier should price adjust if the coupon is for a value higher than the item, though I have found they will either 1) just push the button to accept the full price because they don't know how to adjust or 2) try to tell you that they can't accept the coupon. When #2 has happened to me, I have explained that the cash register beeped because the coupon was greater than the cost of the item and that I would be totally okay with them adjusting the amount according to their "Corporate Coupon Policy." In those instances they have then switched gears to scenario #1 because they didn't know the policy or how to do the price adjust, and that was just the easiest solution. Though I have not had it happen yet, I have heard from others that sometimes the cashier still won't take the coupon, which is unfortunate. It isn't a bad idea to print the Target Stores Coupon Policy and keep it handy when seriously couponing at Target, so that you can clearly show the cashier what their own corporate policy actually says. That still won't necessarily guarantee a happy ending every time, because you're dealing with humans, and we can be very interesting creatures. The good news is that I think those problems are rare compared with the number of successful couponing adventures that transpire at Target. One new feature of Target's coupon policy is that they no longer allow you to use a BOGO coupon along with a coupon for cents off of the paid item. The exception is that you can still stack a manufacturer's cents off for the paid items with a Target BOGO -OR- you can stack a manufacturer's BOGO with a Target cents off coupon for the other paid item. If you still have questions, feel free to post a comment or shoot me an email anytime. Now, get out there and start saving some money already!! !